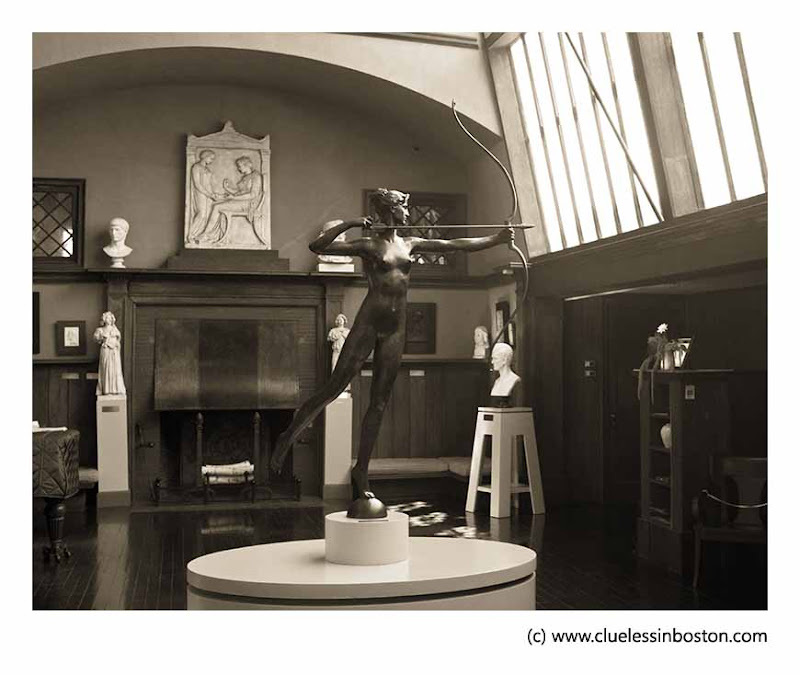 Statue of Diana in the studio of Augustus Saint-Gaudens in Cornish, New Hampshire. A National Historic Park site. "Imagine this diminutive sculpture of Diana the Huntress as a rotating, 18-foot-tall, gilded weathervane atop the tower of the newly built Madison Square Garden. In collaboration with his friend, architect Stanford White (the Garden's architect), Saint-Gaudens originally designed the monumental Diana to reign over the New York skyline, a rival to Bartholdi's Liberty in New York Harbor. But Saint-Gaudens' figure proved too unwieldy to function properly (the original had metal drapery attached as a rudder) and was removed. He then designed a 13-foot version, which also failed as a weathervane and had to be bolted fast to the tower. Saint-Gaudens went on to make Diana of the Tower in several versions and sizes. The National Gallery's three-foot bronze is a simplification of the original: he removed the flowing drapery and placed the huntress on a raised triangular base decorated with winged griffins. 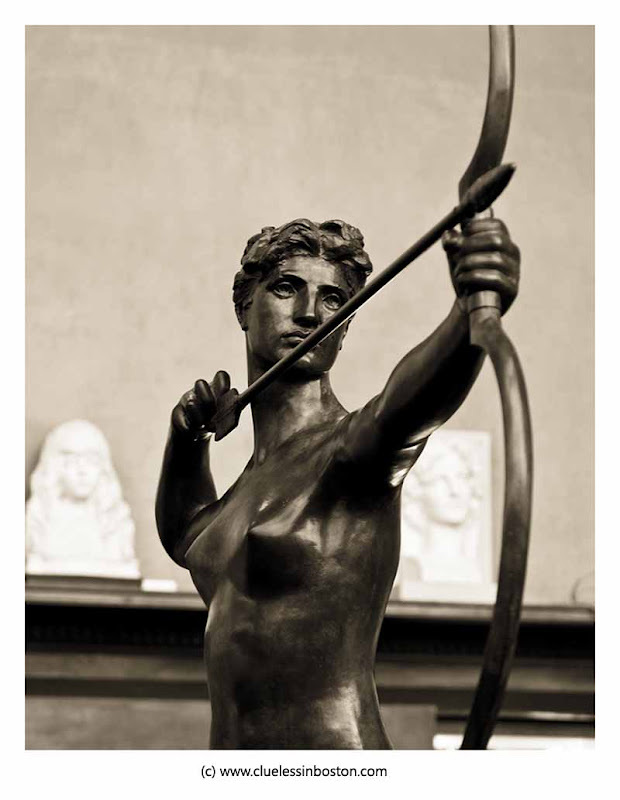 With her slender limbs and graceful pose, Saint-Gaudens' Diana embodies an idealized feminine beauty. Her facial features, based on those of the sculptor's beloved model, Davida Clark, have taken on a classical perfection. Though engaged in vigorous physical pursuit, she remains elegantly composed, standing on tiptoe atop a globe, one leg extended gracefully behind her. Saint-Gaudens achieved a compositional balance, using the strong horizontals of her extended arm, raised elbow, and bow and arrow to counterbalance the figure's essential verticality. Saint-Gaudens would have seen several mythological Dianas in Paris in the 1870s, but an elongated neo-mannerist bronze Diana by Houdon (cast 1741), which had a similar classical coiffure, had the greatest influence on Diana of the Tower. Unlike any of those prototypes, however, Saint-Gaudens' figure was conceived primarily as an eloquent and elegant silhouette, because a weathervane, seen against a bright sky, must be effective as a cutout shape." She is beautiful! What a lovely sculpture, and I love the studio. Your first pic is absolutely fabulous!Makes me think of old pictures of the XIXth century taken by famous photographer Nadar. Great post! Thank you so much. The images are gorgeous. This is really stunning! I can immediately see why she didn't function as a weather vane but she is beautiful nonetheless. She is adorable and I'm impressed by the second composition, such a perfect angle! The composition of the first shot is stunning with its gorgeous light. The second is excellent in detail and focus. What a forceful figure. Both are magnificent, Clueless. I would love to see this studio. The sculpture is superbly graceful. So beautiful. The art of sculpture amazes me. Artists, working in 3D.